The Rupes LHR 21ES Big Foot Random Orbital Polisher is an extreme orbit, powerful and supremely engineered dual-action random orbital polisher. Dual-action random orbital polishers, often called DA's, are known for their ability to safely polish paint without burning it or damaging body panel edges. Because of their unique polishing action, dual-action random orbital polishers create a high gloss finish that is free of circular scratches or buffer swirl marks. The Rupes LHR 21ES Big Foot Random Orbital Polisher retains the benefits of traditional DA polishers while offering a tremendous increase in polishing power. The LHR 21ES Big Foot is makes it possible to completely polish your paint 40% faster than other random orbital polishers. 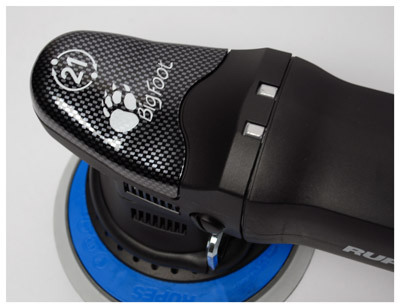 The dramatic increase in performance offered by Rupes Big Foot Polishers is not the result of mistakes or guesswork. It is the culmination of precise engineering, forward thinking, and creativeness. The Rupes LHR 21ES Big Foot Random Orbital Polisher benefits from all of the aforementioned attributes to give you a paint correction tool with the polishing power of a circular/rotary polisher, while retaining all of the benefits of a dual-action random orbital polisher. Whether you're a novice who is looking to achieve professional results in a safe manner or a professional who is looking to increase speed and efficiency, the Rupes LHR 21ES Big Foot Random Orbital Polisher is for you. All machine polishers use friction to remove paint defects such as scratches, acid rain etching, swirl marks and oxidation. The manner in which they create this friction is the result of how they move a polishing pad across the surface. Circular/Rotary polishers use a direct-drive action, which spins the polishing pad at a high rate of speed, to create a high level of friction. 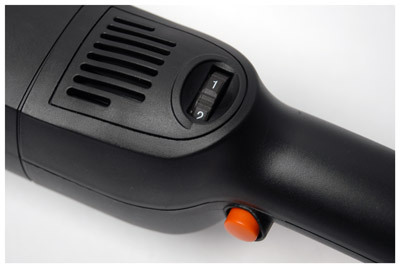 In the hands of a professional detailer, circular/rotary polishers are capable of quickly removing severe paint defects. However, in the hands of a novice, the high-speed spinning motion can overheat the paint or quickly grind edges to bare metal while creating circular scratches known as holograms or buffer trails. Dual-action random orbital polishers move the pad in an orbital motion around the center of the machine, which is similar to how your hand orbits in tiny circles when you manually apply or remove wax. This movement protects against overheating the paint while making polishing around edges significantly safer. The combination of the orbital action along with the rotation of the pad (created by the oscillations) results in a truly random movement of the polishing pad. This prevents the creation of holograms and buffer swirl marks. The Rupes LHR 21ES Big Foot Random Orbital Polisher moves the polishing pad in a large orbit created by a 21 millimeter stroke. The stroke -often called the throw- is the distance from the center of the machine to the center of the pad. Most DA polishers use a 4 to 8 millimeter stroke. By moving the pad as much as 5 times as far per orbit as other designs, the Rupes LHR 21ES Big Foot Random Orbital Polisher is capable of removing paint defects with previously unheard of speed. Because it is a dual-action random orbital polisher, it will never create swirl marks so you can achieve a perfect finish in fewer steps. Despite its 21 mm stroke and 4000 OPM (Oscillations Per Minute) maximum speed, the Rupes LHR 21ES Big Foot Random Orbital Polisher is one of the smoothest, most comfortable polishers on the market. 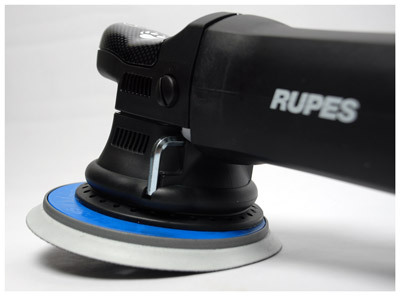 Rupes carefully balanced the weight of the polisher's rotating assembly with the weight of the recommended Rupes 180 mm Foam Pads to create an Italian polisher with the balance of an Italian supercar. You can use the Rupes LHR 21ES Big Foot Random Orbital Polisher for hours on end without experiencing the numbness or tingling in your hands created by other polishers. The Rupes LHR 21ES Big Foot Random Orbital Polisher is powered by an ultra efficient, highly refined 500 watt motor. A speed sensitive trigger and variable speed dial make it easy to select the exact amount of polishing power you need. The Rupes LHR 21ES Big Foot Random Orbital Polisher also features a trigger lock to reduce fatigue during long polishing sessions. Additionally, the Rupes LHR 21ES Big Foot Random Orbital Polisher features Rupes' Soft-Start which gradually ramps the machine up to speed, as well as Rupes' Anti-Spin feature which reduces pad rotation when the pad is lifted from the paint to extend pad life and prevent polish splatter. The Rupes LHR 21ES Big Foot Random Orbital Polisher's outstanding performance is the result of its innovative features and precise engineering. Perhaps the greatest benefit of the Rupes LHR 21ES Big Foot Random Orbital Polisher is that there is no need to press down on the head of the machine to maximize cut. All you have to do is let the combination of the 500 watt motor and the huge 21 mm stroke do the work for you. It is the Big Foot advantage.